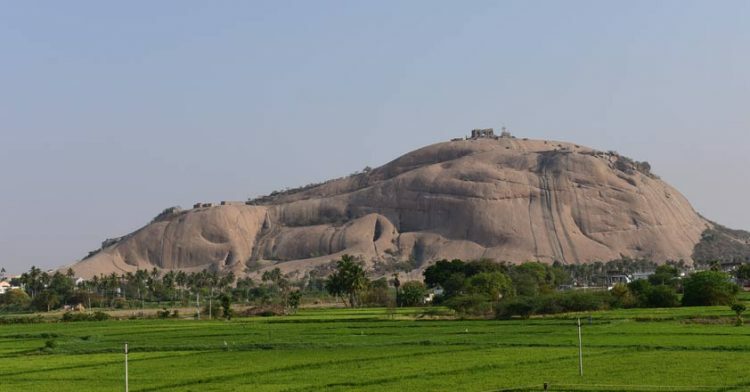 While you travel from Hyderabad to Warangal, you can’t turn your eyes away from a gigantic mountain-like natural rock formation at Bhongir which is the cynosure of all passersby on the National Highway leading to the heritage city. Such is the size of the ‘elephantine’ mountain that one can’t miss the splendid sight, but there is more to it than meets the eye. Digging deep into the books of history presents you some astonishing stories about this monolith rock which houses a fort atop. Geologically, the rock is said to be a ‘Batholith’ structure which is believed to be formed some 2.5 billion years ago. A batholith is a large mass of rock formed from cooled magma deep in the earth’s crust. Usually, it is an exposed area of plutonic rock that covers an area larger than 100 sq km. Though the Uluru Batholith site in Australia, which is designated as UNESCO world heritage site, is considered to be the world’s largest batholith structure, Bhuvanigiri or Bhongir rock is much bigger than Uluru, as mentioned by historian Dr Dyavanapalli Satyanarayana in his book Bhuvanaika Soundaryam which is on the significance of the Bhuvanagiri rock and fort. In the book, he says, the rock is literally ‘Bhuvana Giri’ – the biggest rock (batholith) in the world measuring about 1,410 feet in height and 9.6 sq km in diameter while the Uluru stands at 1,142 feet and 9.42 sq km. When you walk through the meandered path, the first thing that welcomes you is a Hanuman temple, and the kitchens adjacent to it. Then, climbing the steepest part of the hill will lead you to the Raj Durbar. On the way to it, you can find naturally formed ponds (gundaalu) which will be full of water to the brim, flowing from the top of the hill during the rainy season. All these arrangements tell us about how different kingdoms used the nature of the rock to their advantage and created many facilities to have a comfortable stay. 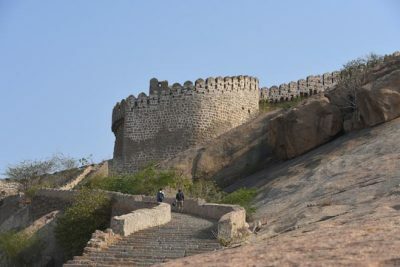 There are many versions of stories about this fort which lies on the top of this unique rock, but, the fact that remains is – many dynasties from Vishnukundins to Chalukyas to Kakatiyas to Bahamani Sultans used this impregnable fort for their activities. “The place was used for training soldiers and military activities. 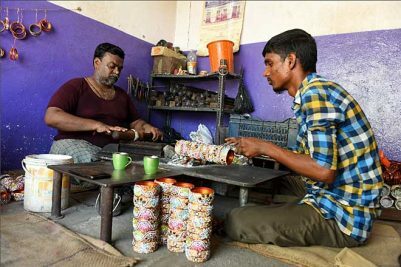 It was used as security post and also weapons were manufactured here,” says Aavula Vinod, a local guide. He adds that a unique method of construction was followed in constructing the fort walls here which are 8 to 16 feet high. The impregnability of the fort made it a much sought-after place for many kings. There are many tales surrounding the name of the batholith and the fort, and the popular one is that Bhuvanagiri was named after Western Chalukya ruler Thribuvanamalla Vikramaditya VI, as Thribhuvanagiri which, later, became Bhuvanagiri (Bhongir). The other legend, according to Adhiraju Veerabhadra Rao in his Bhonagiri Katha, is that it was named after a shepherd Bhonaiah and his wife Giri who helped a king in finding this rock to construct the present fort. However, Vinod says that the fort was constructed by Thribuvanamalla Vikramaditya and, later, other kings modified it according to their need and convenience. He adds that there are tombs of the early man surrounding the fort area and also there are some historical remains belonging to Vishnukundis’ period, on the fort. All these proofs solidify the claim that the place was inhabited with humans from thousands of years. 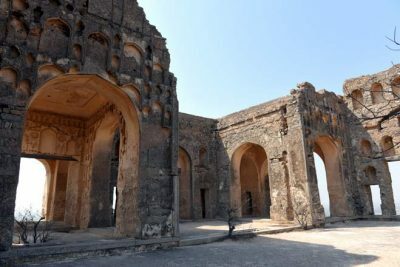 Though there are varied versions of history about the construction of the fort, the fact that the place was home to seven kingdoms for military camping with 10 temples, 10 inscriptions, seven Muslim religious constructions, and around 10 small waterbodies, is beyond any doubt. The Bhongir rock is a paradise for rock climbing enthusiasts, the rocky terrain offers a suitable platform to learn rock climbing with a scope to practice various grades at one place. A rock climbing school was established here in association with the Telangana Tourism with a mission to make Bhongir the rock climbing capital of India. “Made of solid granite of the Deccan plateau, the rock offers excellent features for training in rock-craft, hiking, rescue, long-pitch abseiling, mountain biking, etc,” says Parmesh Kumar Singh, Chief Instructor of the School. Vinod says that opening a rock climbing school has increased the tourist footfall and the fort is earning a good reputation. The school currently offers professional certificate courses in basic, intermediate and advanced rock climbing, and also an adventure course for youth. Along with the courses, recreational activities such as one-day orientation course for adventure sports, 300 ft rappelling experience, workshops for corporates, and sports academies for team building, stress and risk management are provided here. The rock also holds a distinction of training Malavath Poorna, the youngest girl in the world to scale Mt Everest, the largest peak in the world. She was trained here under the guidance of mountaineer Shekar Babu, a recipient of Tenzing Norgay National Adventure Award. Also, about 30 individuals who have successfully reached the summit of Mt Everest learnt their first lessons at this rock. 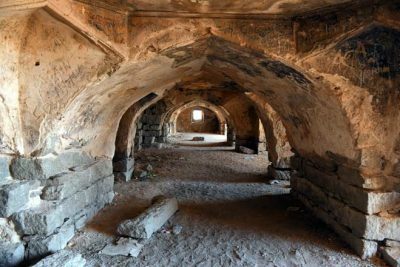 Vinod, who was living near the fort since his childhood, says that, earlier, the fort had around 148 acres land, including the surrounding areas, and now only 42 acres are left, including the rock. Also, there is only minimum maintenance taking place at the fort with almost zero development. Sharing an interesting story, Vinod says, there is a myth in the town that any public representative trying to develop the fort will not have a good future and might not win the next election. This popular sentiment has crippled the prospects of the fort development, he laments. He says that annually around 150-200 foreign tourists are also visiting the site and construction of a highway road very near to the fort has also helped the tourism, as the huge rock is now clearly visible from the highway. Vinod says that a few years ago, some funds were released and that helped in the construction of washrooms at the entrance, information centre, steps, etc. However, with the Yadadri Temple which is getting a facelift by the Telangana government is located near to Bhongir and also the All-India Institute of Medical Sciences (AIIMS), which was recently sanctioned, will come up at Bibinagar which is just 13 km away from the fort. All these developments will contribute towards forming a tourism circuit connecting Yadadri, Kolanupaka Temple, and Bhongir Fort – which is on the cards. A detailed project report (DPR) regarding the circuit was also under active consideration with the State government. The State government already sanctioned the ropeway, and the project execution is underway. And plans are afoot to set up cycling track, walking track, lighting and sound system at the fort soon. The place already boasts of a rich heritage with strong fort walls, halls, raj bhavan, ponds, fountains, wall decorations, etc. 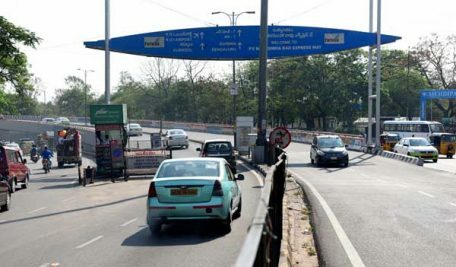 With its proximity to Hyderabad and well-connected by rail and road network, the spot has a bright tourism potential. With more sustained efforts to put the largest monolithic batholith rock on the world map and introduction of modern facilities can attract tourists and turn the location into a popular tourist destination which offers a dash of ecology, history, archaeology, and mountaineering at a single stop.